In 2015 and 2016, we got Christmas trees at Able's on Sunrise. We were extremely happy with the trees that we got there. When that lot disappeared in 2017, we weren't sure what to do. We stopped at a lot at Cal Expo and then at Lamb's in Elk Grove. We bought trees at Lamb's from 2009 to 2014. We ended up buying a flocked tree at Lamb's. Sharon and Jack were very unhappy with the tree; they felt that it was too small. Last Wednesday night [November 28], Sharon and I stopped at Bambi's Christmas Trees at Douglas and South Harding. Apparently, this lot has been there for years. They had a wide assortment of large trees, they flock trees and they deliver. We headed up buying a tree tagged as 11 to 12 feet. It was delivered tonight. Sharon went home early to meet them. By the time I got home, the tree was in the house and up on a stand. 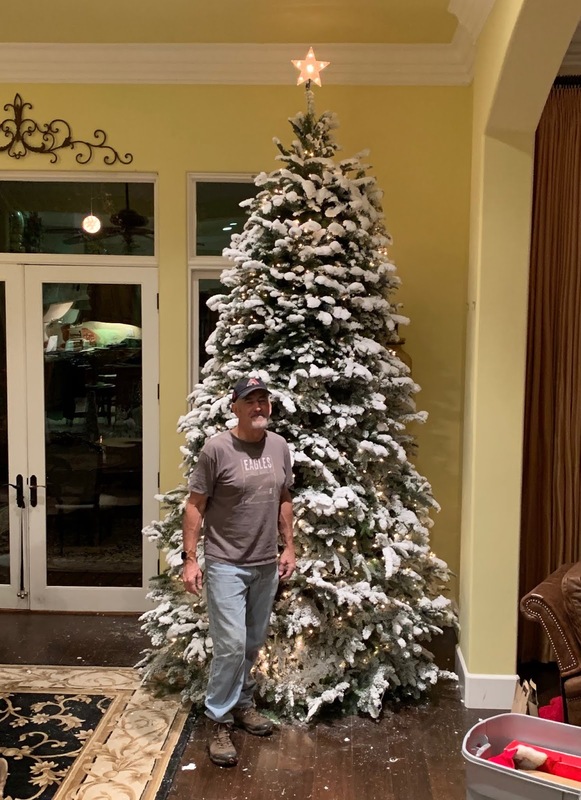 It is definitely the biggest tree that we have ever gotten!